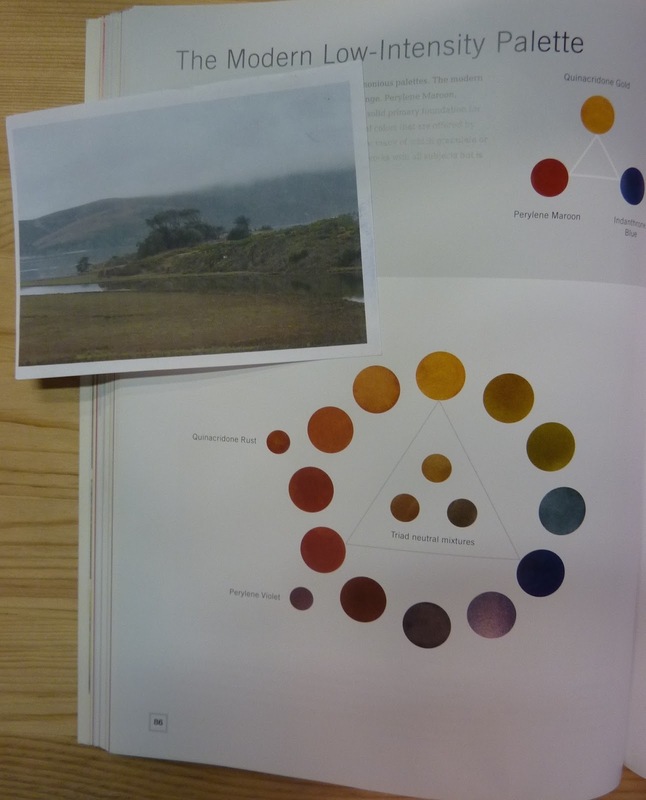 Painting My World: Why Should We Explore Color Schemes? Why Should We Explore Color Schemes? Every once in awhile I take out my favorite book on color and play with color palettes and color schemes. 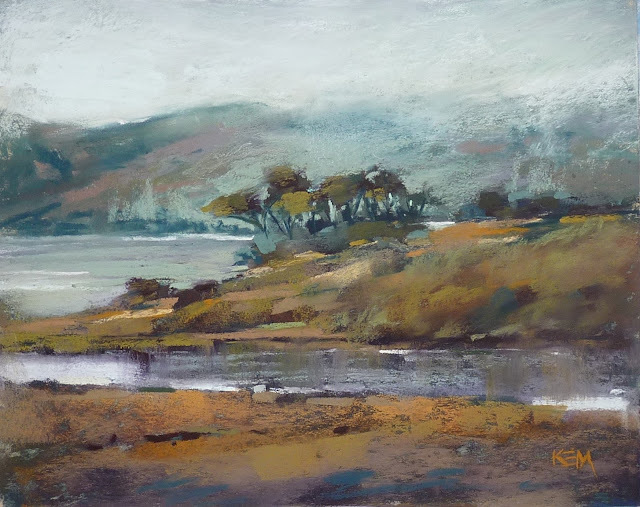 I don't usually choose my pastels for a painting according to a specific scheme. I tend to choose my palette with colors that I hope will tell the story of my painting....set the mood and tone with color. It is more of an intuitive process. But that process can lead to stagnation. Before I know it I am choosing the same colors for every painting. That is when working with color schemes comes to the rescue. Exploring other color schemes and color combinations makes us more aware of the possibilities of color. It allows us to see other ways of choosing harmonious color that is interesting and exciting. The more we experiment and explore, the more information we have to make intuitive colors choices that work. For today's painting instead of just randomly selecting pastels I decided I would use a triad of red, blue and yellow. I chose my pastels based on what Nita Leland refers to as the Modern Low Intensity Palette. This is a R,B,Y triad that is based upon using modern pigments of Quinacridone Gold, Perylene maroon and Indathone Blue. 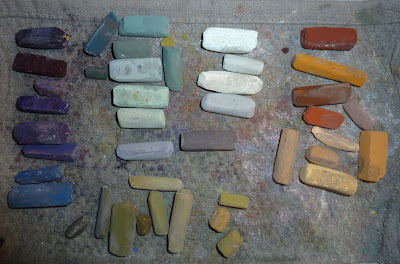 For my painting, I selected pastels that closely matched these colors. I did add in a few greens so it isn't technically strictly RBY. The result was a palette of colors that I wouldn't normally select but one that perfectly captures the mood I wanted to convey. Exploring color schemes and trying new color palettes feeds our brains with color information that we can use to expand the way we use color. 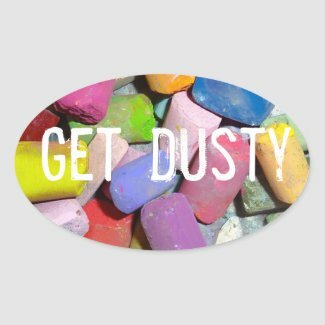 It is well worth the time and effort and it should be an important part of your development as an artist. Interesting palette, it created its own atmosphere. Very chill and wintry, at least for Arkansas winters. I hadn't thought of a muted primaries palette for anything and seeing it was cool. It works well for atmosphere! I choose colors intuitively for that painting too. But the one line answer that came to my mind at the title was "Because that justifies collecting over a thousand pastels and means I'll actually use them all." Eh, for someone who does always like getting lots of new colors it's a very cool thing (good excuse). Can't wait till they get my studio built and I can spread them all out at once. It'll be fun!